Home » champions league , champions league finals , fc barcelona , fc chalke , manchester united , real madrid , second leg » Who will be crowned 2011 Uefa Champions League Champion? Who will be crowned 2011 Uefa Champions League Champion? Now that only four teams are left for the 2011 Champions League tournament. Who will be crowned champions? 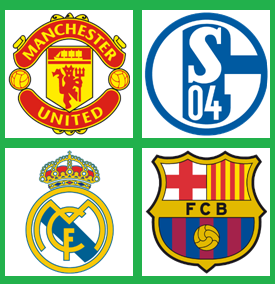 With the first legs of the semi finals going to FC Barcelona (2-0 win against Real Madrid) and Manchester United (2-0 win against Schalke FC), I'd to say that FC Barcelona and Manchester United will most likely meet in the finals, there's a big BUT we can't just take out Real Madrid and Schalke for a space in the finals. I mean, having reached this far, they won't simply hand over the opportunity of becoming Champions and the right to be called the #1 football club in Europe. The ball is round and 90 minutes is enough to create an upset for FC Barcelona and Manchester United. Anyway, Manchester United for the win! :) Hahahaha... Hope they'll be crowned champions once more!! Glory glory Man United!! I vote for Madrid! Ganbatte yo! Woot! Madrid all the way!